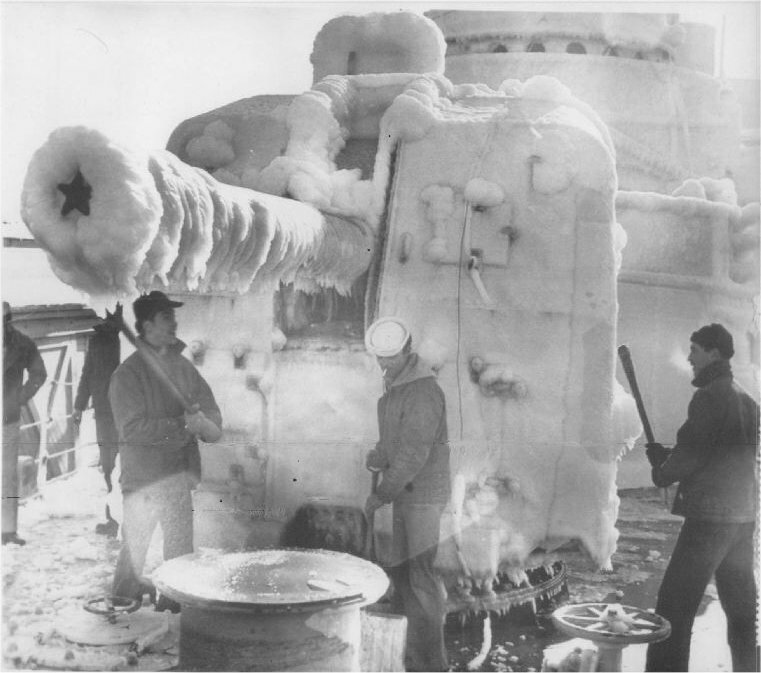 Laid down , 23 August 1943, at Lake Washington Shipyards, Houghton, WA. 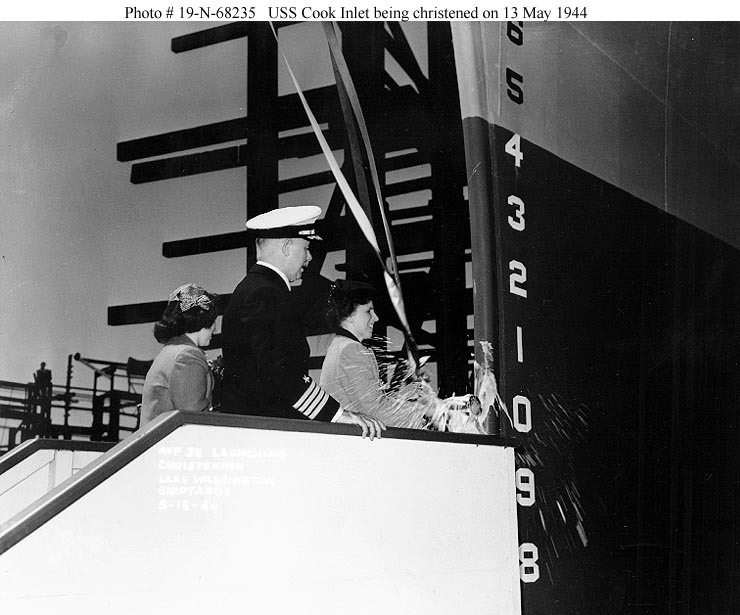 70k Cook Inlet (AVP-36) being christened by Mrs. H. K. Stubbs during launching ceremonies on 13 May 1944 at the Lake Washington Shipyards, Houghton, WA. 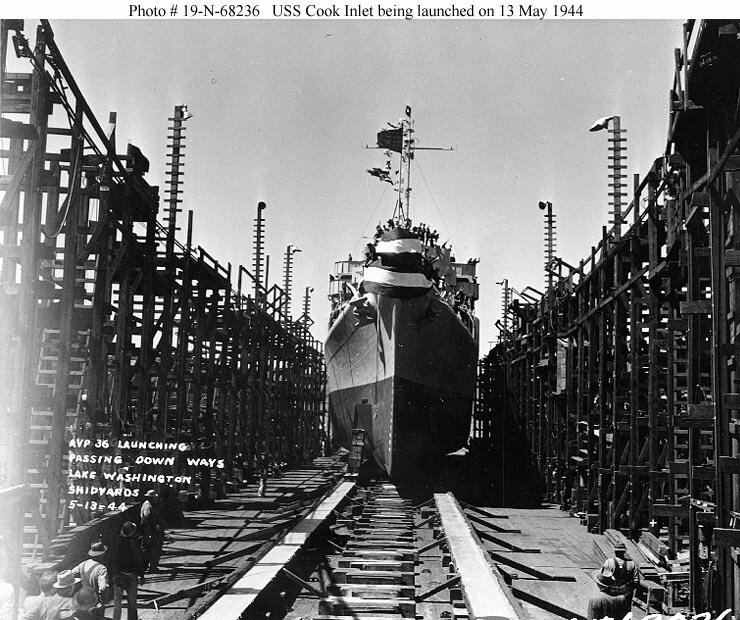 136k Cook Inlet (AVP-36) being launched at the Lake Washington Shipyards, Houghton, WA., 13 May 1944. 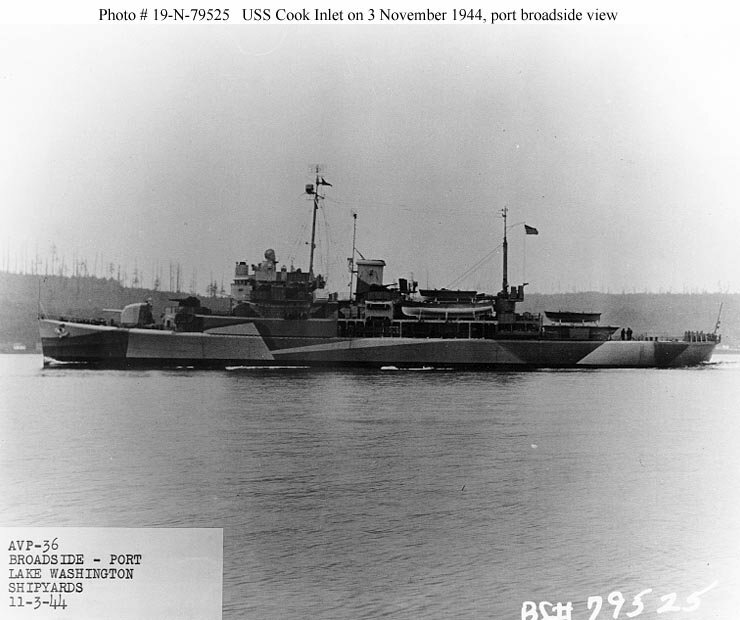 73k Cook Inlet (AVP-36) photographed off Houghton, WA., 3 November 1944, two days before commissioning. 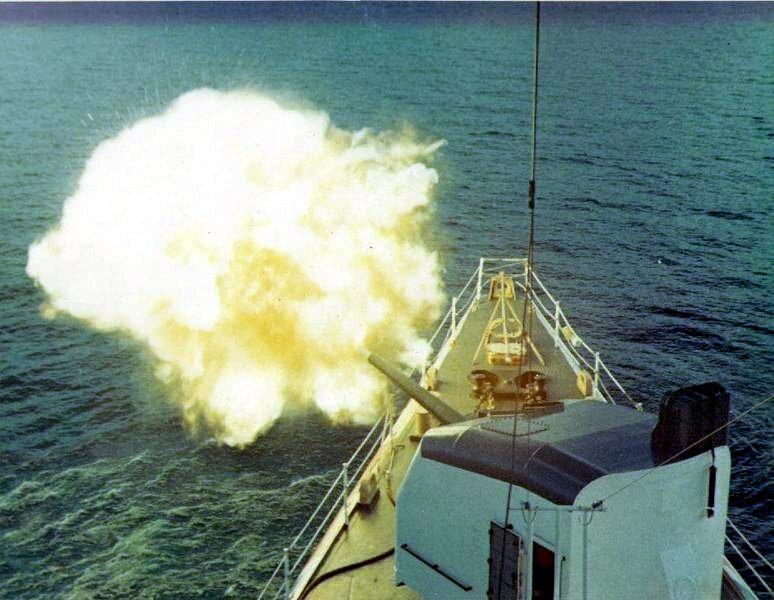 She has a main armament of 1-5"/38 gun and carries boats on her otherwise clear fantail. Note her camouflage measure 33/1F. 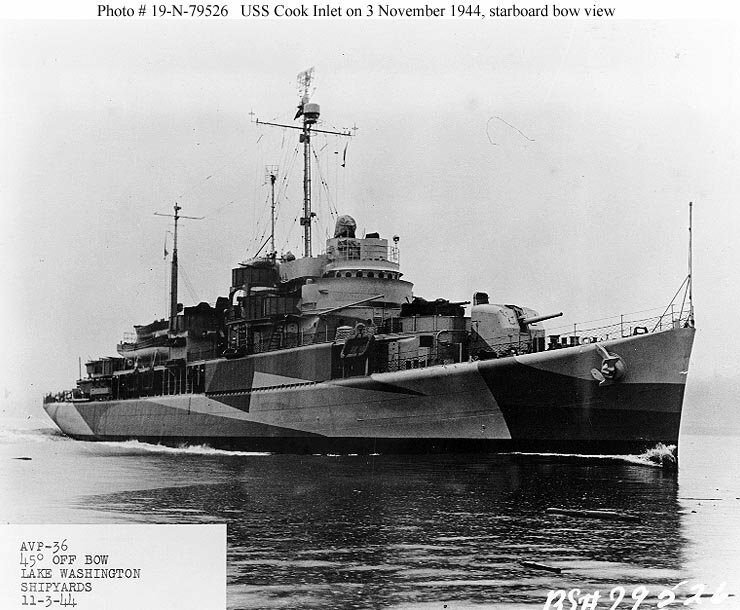 96k Cook Inlet (AVP-36) photographed off Houghton, WA., 3 November 1944, two days before commissioning. Note her camouflage measure 33/1F. 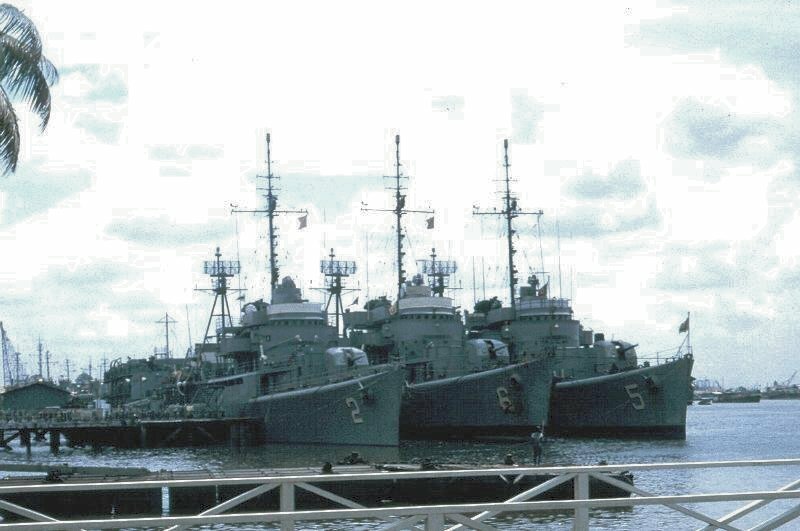 125k Amidships looking forward plan view of USCGC Cook Inlet (WAVP-384) at Mare Island Naval Shipyard, 24 January 1949. 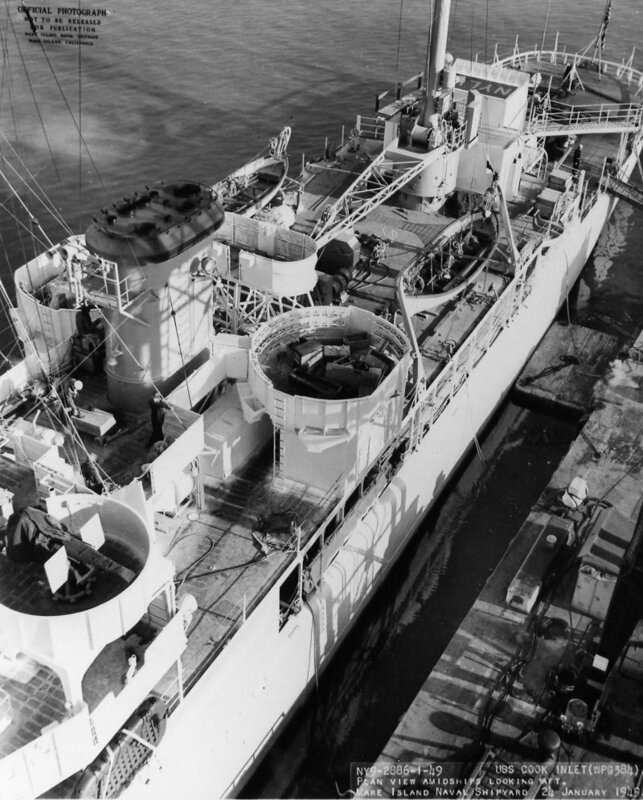 Cook Inlet was under repair at the shipyard from 17 September to 27 October 1948. 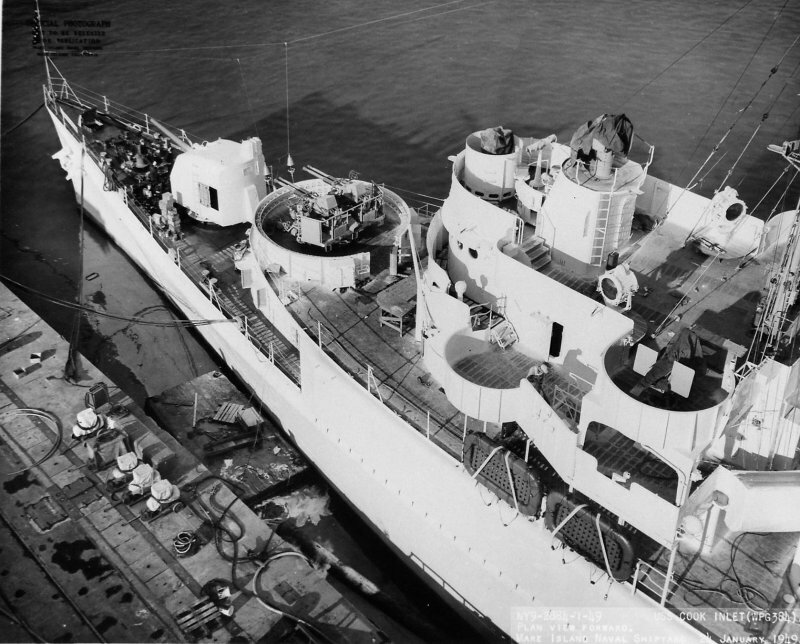 193k Amidships looking aft plan view of USCGC Cook Inlet (WAVP-384) at Mare Island Naval Shipyard, 24 January 1949. 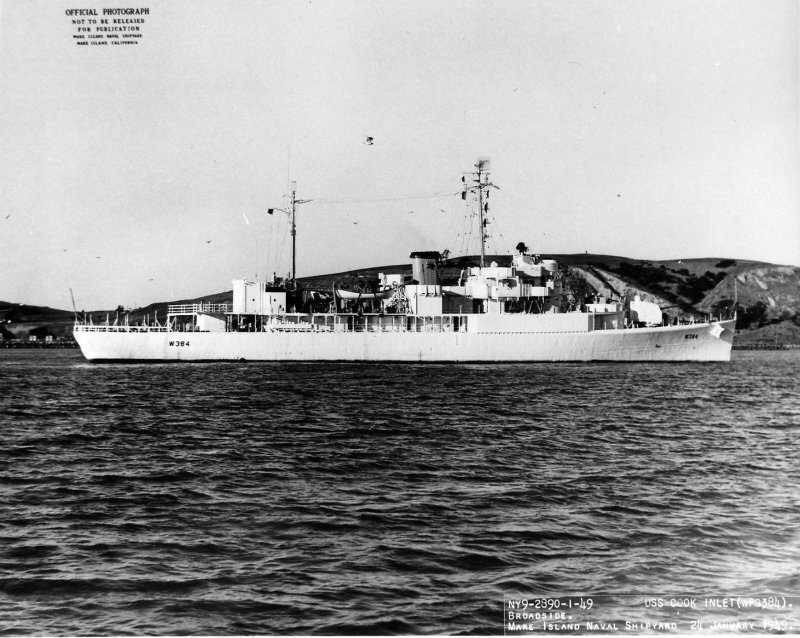 118k Broadside view of USCGC Cook Inlet (WAVP-384) off Mare Island Naval Shipyard, 24 January 1949. 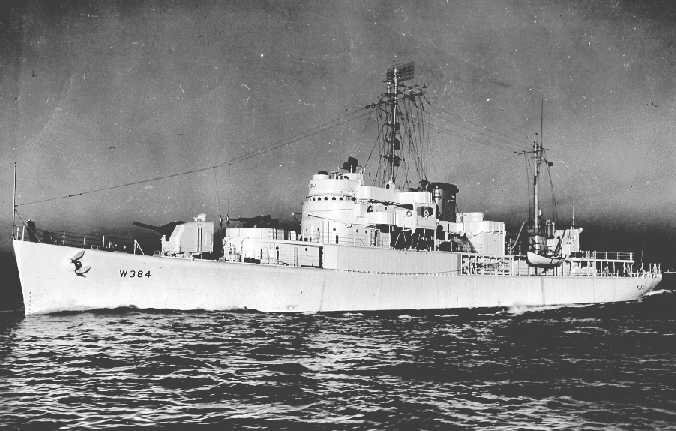 59k USCGC Cook Inlet (WAVP-384) underway in 1949, location unknown. 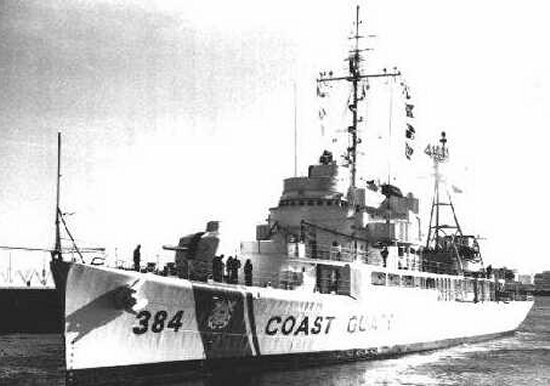 90k USCGC Cook Inlet (WAVP-384) under way, location unknown, prior to the Coast Guard's 1967 adoption of the "racing stripe" markings on its ships. 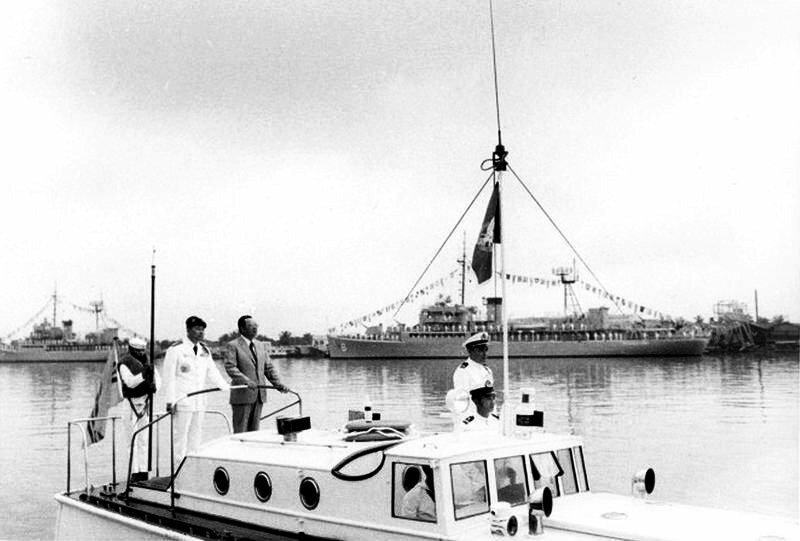 77k Ice encrusted USCGC Cook Inlet (WHEC-384) arriving at Portland, ME., 28 January 1971. Cook Inlet encountered minus 9 degree weather about 75 miles off the coast of Maine while returning from ocean station Charlie in mid-Atlantic. 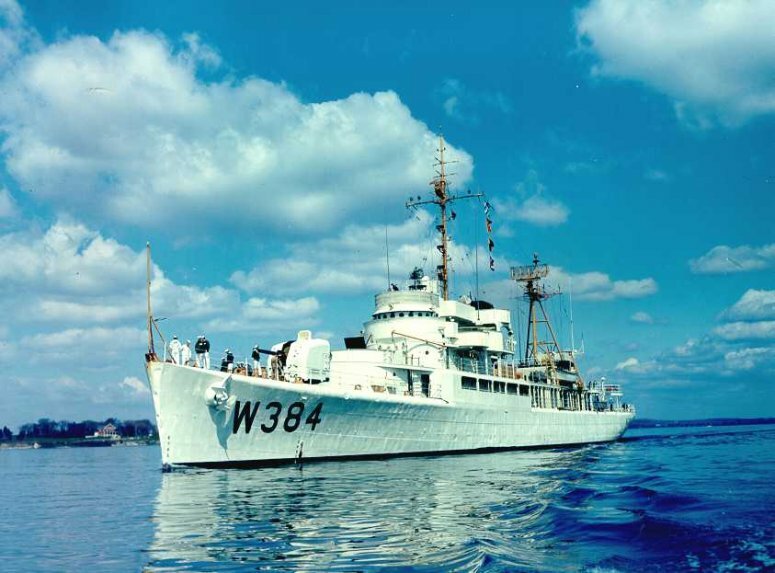 137k USCGC Cook Inlet (WHEC-384) conducts a close fire support mission off the coast of Vietnam in 1971.